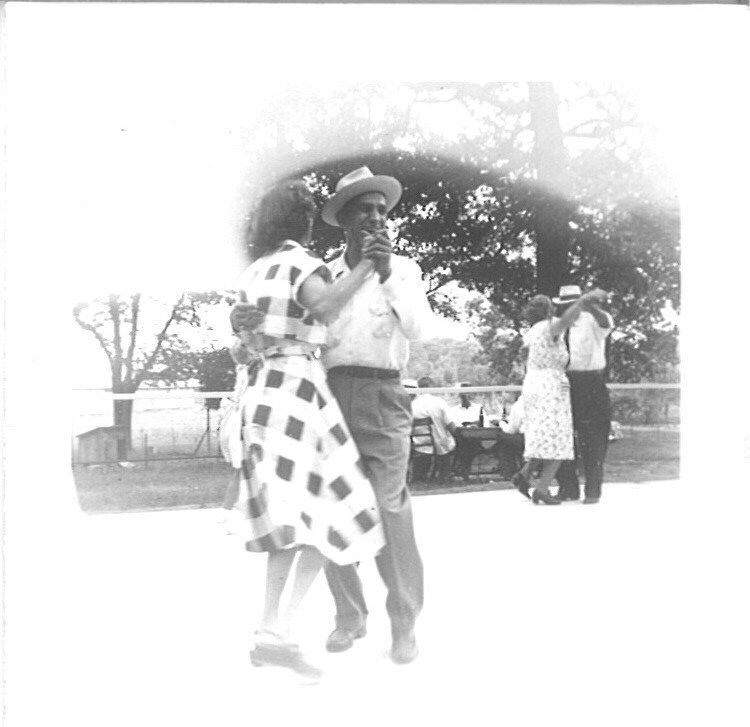 Frank Pakey dancing at “Lithuanian Lodge” picnic, 1950s. From the 1930s through the late 1950s, Springfield seems to have been home to the “Lithuanian Lodge,” a.k.a, the local lodge of the leftist fraternal benefit society known as the Association of Lithuanian Workers (ALW). In October 1949, the Illinois State Journal ran an announcement of a lodge picnic at the Pakutinskas (Pakutinsky or Pakey) farm on Mechanicsburg Road about seven miles east of the city. Wikipedia says the ALW was established in June 1930 as a communist-leaning splinter of the Lithuanian Alliance of America. I quickly get lost in the alphabet soup of twentieth century American leftist organizations with Lithuanian-language branches, not to mention exclusively Lithuanian left-wing groups. However, two facts about leftist Lithuanian immigrants of the first wave seem interesting: According to some sources, Lithuanians frequently constituted the largest foreign language group on the early American left. Second, although illiteracy was the rule among first-wave Lithuanians, it seems that many of those who were educated gravitated to socialist organizing and publishing. 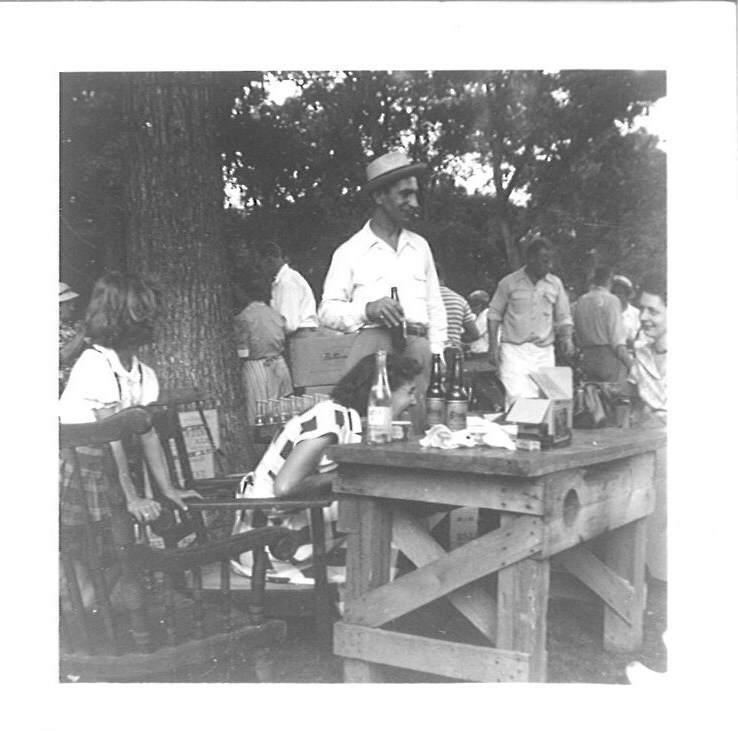 Frank Pakey chatting up the ladies at “Lithuanian Lodge” picnic, 1950s. When the Socialist Party of America split in 1919, its communist-leaning Lithuanian Socialist Federation branch moved en mass into the newly formed Communist Party of America, and Laisvė became an organ of the CPA. (The “lodge” or ALW had its own national publication, Tiesa (Truth). 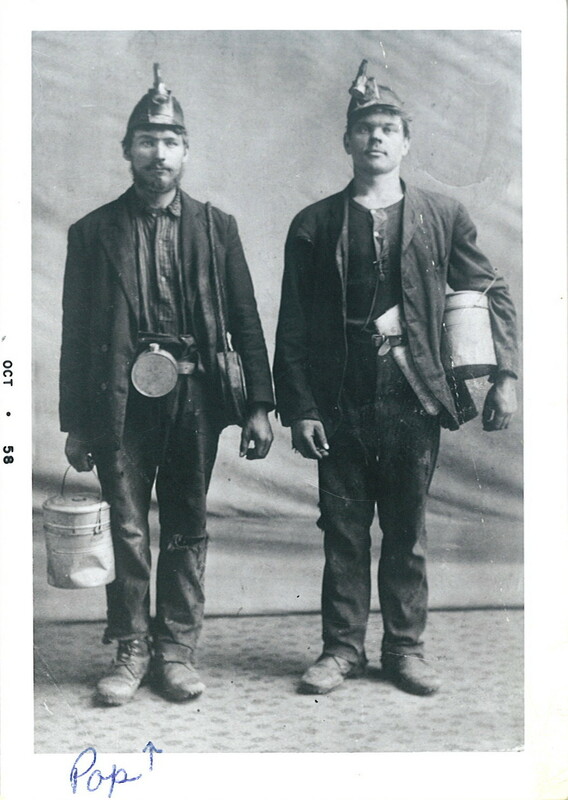 Joseph Pakutinskas, left, Herrin, Ill. coal miner, 1910s. 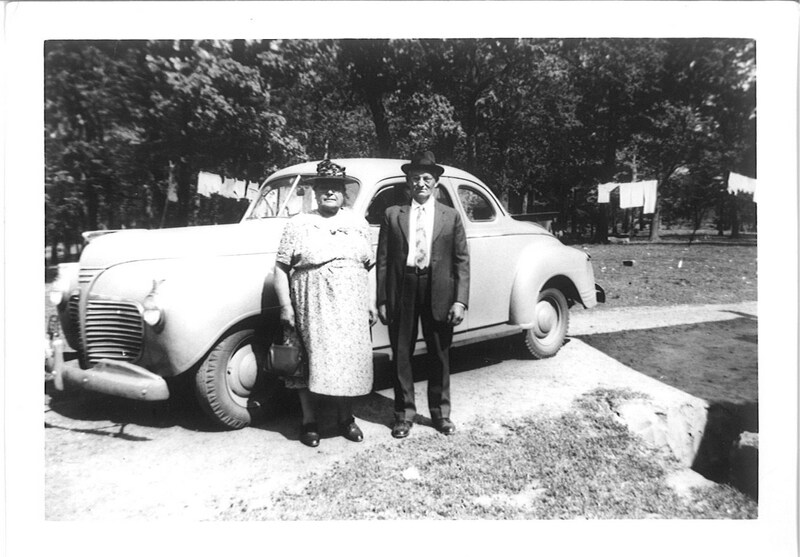 A local man who wrote for Laisvė during the 1930s under the pen name, “Urbana Farmer,” was Joseph Pakutinskas (Pakutinsky), who owned the aforementioned 80-acre farm on Mechanicsburg Road with his son Frank Pakey. Joseph and his wife Anna Janusauskis were born in Lithuania in the 1880s, and immigrated to the U.S. around 1907. According to grandson Donald Pakey, Joseph was a coal miner in the Herrin area and later a farmer in Champaign County before settling in Sangamon County. What Don, a physics professor at Eastern Illinois University, remembers from family lore are his grandfather’s radical writings for Laisvė and the lively summer picnics of the Lithuanian Lodge on the Pakey farm. The Pakeys even had a cement slab laid in the picnic area to create an outdoor dance floor. When he was a toddler, Don joined the picnics in a play pen, where he was not alone. A goat that his older sister Emily bought from one of the Lithuanian-American women for three cents was small enough to squeeze in through the bars of the pen and play with him. Although he was too young to remember, Don’s guess is that the Lithuanian Lodge Pakey farm picnics ended when his grandmother Anna died in 1958. 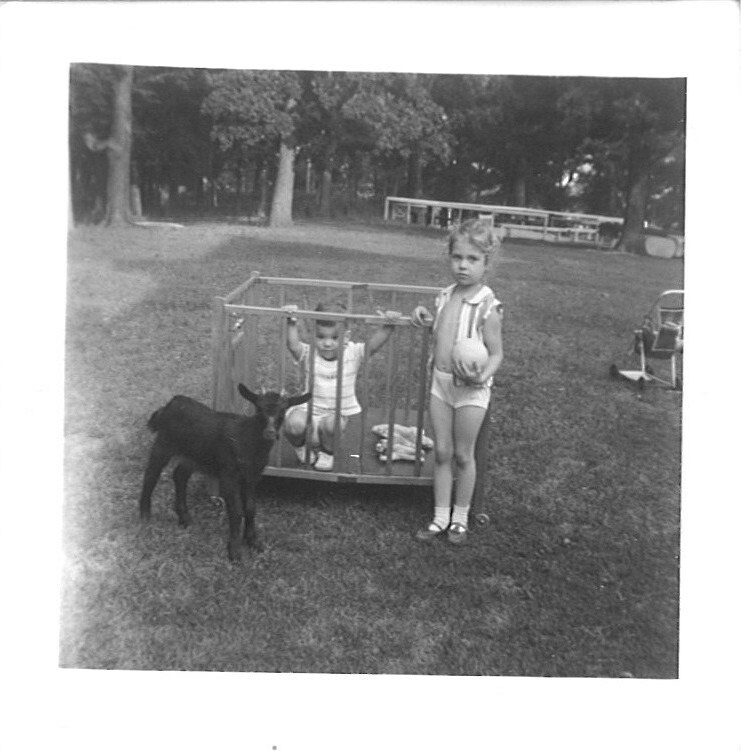 Don Pakey in playpen, sister Emily and “the goat.” Pakey farm, 1950s. Don’s father Frank and Uncle Pete attended the University of Illinois in the 1930s and fought in World War II. Immigrant leftist organizations provided self-help and cultural resources, like libraries, choirs and drama clubs. But even more important, they served as vehicles, often in concert with labor unions, for the struggle against the shameless exploitation of unskilled immigrant workers in mines and factories. 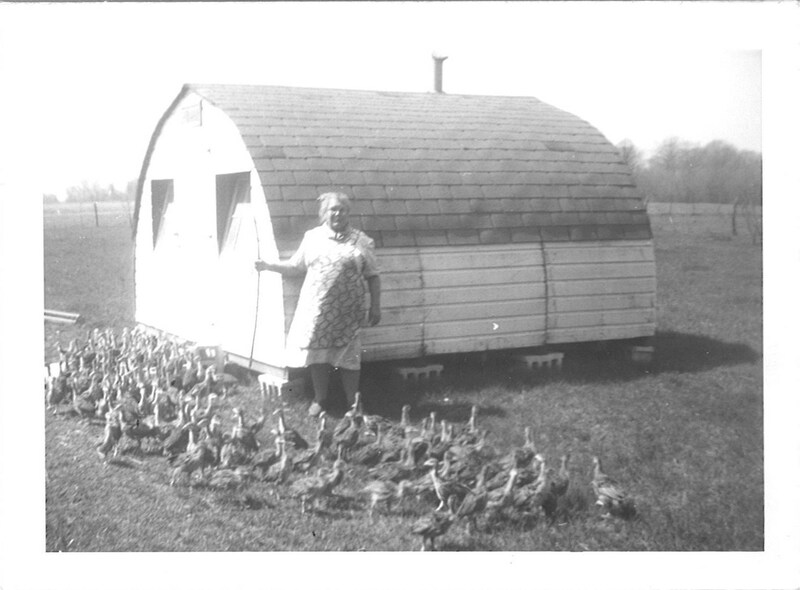 “Mamita” (Anna Janusauskis Pakutinskas) with her baby turkeys, Pakey farm, 1950s. To the extent that the U.S. government served more powerful corporate and national interests, immigrant socialist and communist organizations were feared, from their inception, as real or potential enemies of the state. During World War I, they organized pacifist opposition that was an open threat to the draft. As a result, Congress passed the Espionage Act of 1917, subjecting those who opposed or interfered with America’s war effort to jail time and/or deportation. In fear of the radical foreign language press, the Sedition Act was passed in 1918 to include even opinion that cast the government or the war effort in a negative light. Although the Sedition Act was repealed in 1920, the Espionage Act was upheld by the Supreme Court, and beginning that same year, a succession of U.S. laws closed the spigot of mass immigration from Southern and Eastern Europe that had fueled so much growth on the American left. After the Russian revolution, American leftists tied their leadership, philosophy and actions to that single existing example of communist government, the U.S.S.R. This was less of a perceived threat during World War II, when the U.S. allied with the Soviet Union to defeat fascism. However, with the beginning of the Cold War, organized communism in the U.S. was actively suppressed. Most of us have heard of McCarthyism and the Hollywood blacklisting of Communist Party members and sympathizers. 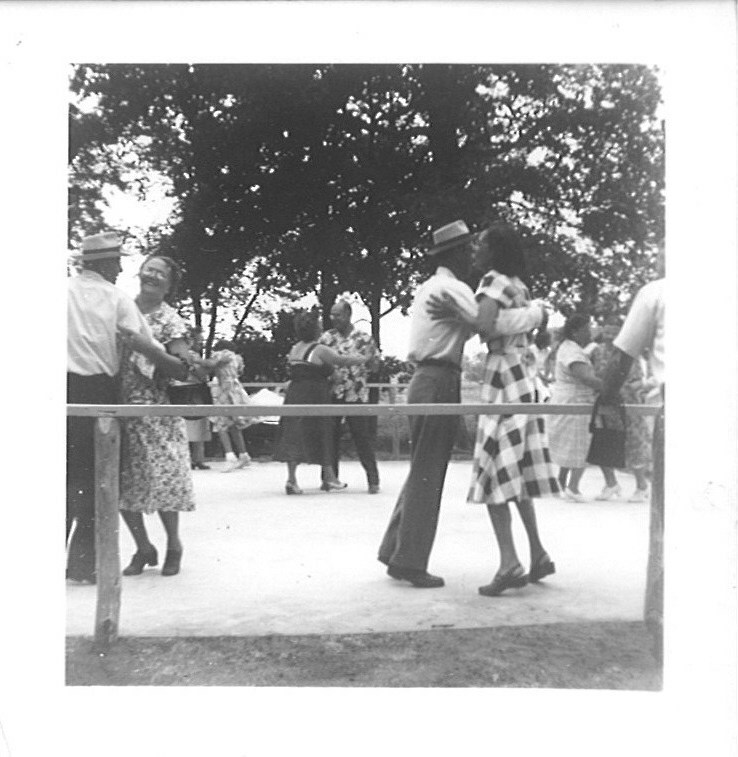 Outdoor dance floor at Pakey farm picnic of the “Lithuanian Lodge,” 1950s. Lithuanian leftist groups supported racial equality and were racially integrated. Leftist party ties (in some cases, slavish ties) to Soviet leaders and policies made them not only a perceived threat to the U.S. government, but also stubbornly blind to the Siberian gulag of Soviet dictator Josef Stalin. The left’s blind allegiance to the U.S.S.R., including the 1940 Soviet re-conquest of Lithuania, was a fundamental cause of conflict and division in Lithuanian-American communities like Springfield’s. 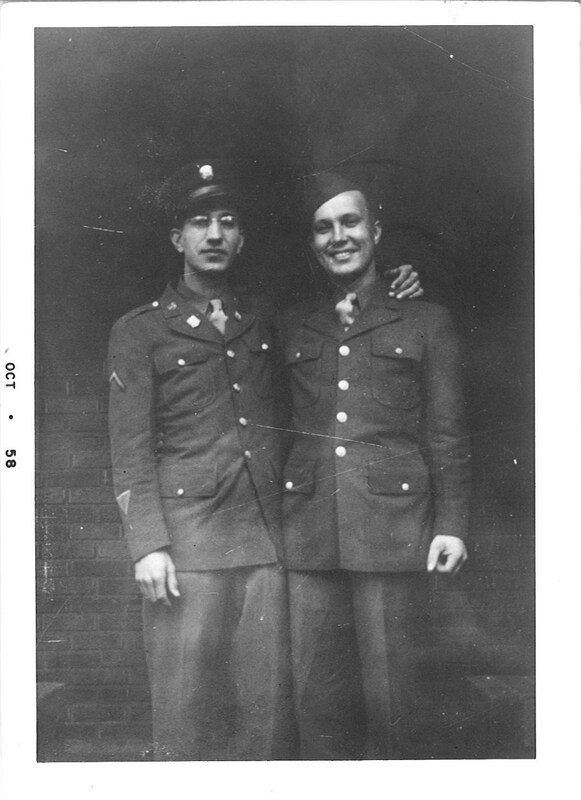 From left: brothers Frank and Pete Pakey in U.S. Army uniforms, World War II. With the arrival after World War II of Lithuanian eye witnesses to Soviet brutality, in the form of displaced persons (DPs) like my father, it had to become increasingly precarious to remain a Lithuanian-American Stalinist. Yet decades of true-believer orthodoxy and a lifetime of struggle probably made it emotionally hard even to listen to such witnesses, let alone embrace what they said. For Dad’s part, living through one Soviet occupation in 1940 and narrowly escaping another in 1944–fleeing thousands of miles into exile and losing his homeland and way of life in the bargain–only to encounter Lithuanian-American communists parading on stage in Springfield in Red Army uniforms, had to be nothing less than traumatic. To this day, it strikes me as grotesque that the twentieth century’s first two waves of Lithuanian immigration to the U.S. had to be divided, brother against brother, by two contradictory visions and experiences of communism. For many first-wavers like Joseph Pakutinskas, communism probably was first and foremost about building a world where working people weren’t oppressed by company bosses and their political hacks. (Joseph’s leftist leanings also could have had roots in Lithuania’s anti-czarist movements of the late 1800s.) Yet Lithuanian-American communists’ hierarchical subordination to the Soviet Communist Party, even to the extent of embracing the Soviet conquest of Lithuania, was the ultimate fatal flaw. Anna and Joseph Pakutinskas, circa 1950. Despite being similarly impacted by assimilation and the death of the first-wave immigrants who formed their backbone, Lithuanian leftist associations in Springfield seem to have declined more precipitously than Lithuanian Catholic groups. This may have been partially due to tendencies towards schism on the national level, and Cold War era attacks on the organized left. However, second-wave immigrants no doubt provided new blood for the parishes, while at the same time undermining the left’s core reliance on the moral superiority of the U.S.S.R.
Trans-generational upward mobility through education, the success of labor unions, and increasing access to white collar professions in Springfield also incrementally stole much of the left’s thunder. The break-up of the Soviet Union in 1991– ironically, on the force of determined Lithuanian, Latvian and Estonian independence movements–precipitated the ultimate crisis for the Lithuanian-American left, along with leftist movements around the world. Wow! That’s quite a history lesson! You have gone from simply reporting interesting family stories to reminding us of the political undercurrents that accompanied them. Thank you and congratulations on putting together some fascinating history! Fascinating. Thank you for the history. Thank you for the history.My grand grand grand parents emigrated to Chicago that time,their daughter moved back to Lithuania 1950-1955.I still keep looking for relatives to finish my family tree. They were and are Babarskiai. Don, I’ll also let you know if I hear anything. So far, all I have heard is that a near (Lithuanian-American) neighbor on Mechanisburg Rd, near Pakey Rd., never even knew about the picnics. Enjoyed reading this history story. Sandy…you are such a “digger” of information. So happy to learn from you. Your talent and hard work are to be admired……THANK YOU!!!! my grandfather is Pete Pakey. He had two daughters JoAnne and Patricia. I am Patricia’s daughter. We heard numerous stories like this one and also have pics of “Mamita” and other family members during this time. My mom was also on this farm and feed the chickens and went tot he picnics. Stephanie, thanks for commenting. Would you like to share any of your photos? I can add them to the blog post.